Most people have heard the phrase “he’s taking the Fifth” in news stories, TV dramas, and movies. This phrase refers to an important privilege against self-incrimination guaranteed by the Fifth Amendment to the United States Constitution. Whether you are a witness or a defendant in a criminal proceeding, you need to understand this important constitutional right. If you are at all worried about your right to assert it, you need to consult with an experienced criminal defense attorney who can help you make the best decision on how to proceed. When Can You Invoke Your Right Against Self-Incrimination? Compulsion. The Fifth Amendment only protects against compelled communications. That means that information voluntarily provided without any compulsion may be used against the person who provided that information. Testimony or Document Production. The right against self-incrimination only protects against testimony, which can be given through speaking or written documents that disclose information in the person’s mind. This means that it does not protect against requests to produce non-testimonial evidence, such as the taking of handwriting, blood, urine, DNA, and fingerprint samples. Self-incriminating. In order to be considered self-incriminating, the statements sought to be compelled must be such that it may lead to criminal prosecution or lead to other evidence that will be used for this purpose. This includes information that provides links in the chain towards a possible prosecution of the individual. What Happens If a Defendant Pleads the Fifth in a Criminal or Civil Case? A defendant has the right to decline to testify at his trial or at his sentencing. The judge, prosecutor, or defendant’s attorney cannot force a defendant to testify. If a defendant asserts this right, the jury or judge deciding the case is not permitted to take the defendant’s decision not to testify into consideration when deciding his guilt or innocence. In fact, prosecutors are prohibited from commenting negatively on a defendant's decision not to testify. However, a defendant can waive that right by taking the stand and testifying, and he becomes subject to full cross examination. In some cases, a defendant may also be sued in a civil lawsuit by the victims of his alleged crime, such as in a civil lawsuit following a car accident. A defendant can invoke his right against self-incrimination in the civil case as well as the criminal proceeding. However, in the civil case, the jury may be allowed to make certain inferences from the refusal to testify, and the defendant may be barred from presenting certain evidence. The right of a witness to refuse to testify is different than that of a defendant. In both civil and criminal cases, witnesses who have been subpoenaed cannot refuse to take the witness stand. They must be sworn in and then are allowed to selectively refuse to answer questions that may incriminate them without waiving their right against self-incrimination. 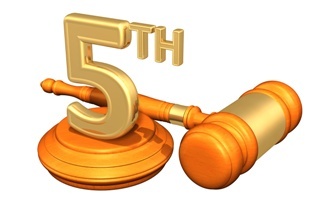 If the Fifth Amendment privilege is asserted, the trial judge must determine whether the privilege applies or whether the witness may be compelled to answer specific questions. Do you have questions about your right to invoke your right against self-incrimination? Are you facing criminal charges? Our experienced criminal defense attorneys are here to help. Call our office today to schedule your free, no-obligation consultation.